They are supposed to be but they always aren't, heck, the old alignment of NS 104 through Antigonish had a speed limit of 50km/h and you had to pass through a few fairly busy intersections. Indeed some portions of Hwy 104 even on mainland Nova Scotia are not controlled access as you occasionally see private driveways. If memory serves me right, the only controlled access portion of NS 105 is the last 3 or 4 km on the approach to the ferry terminal. Indeed Hwy 105 has 4 traffic lights on the route if I recall. About this plan, I find it funny how there's a road planner for either side of the Canso Causeway but no actual real replacement for the Causeway itself. Indeed we may just have freeways on either side of the Causeway but yet a sailboat wanting to cross the Canso strait can hold all traffic hostage. I haven't figured out what's going on with the Causeway. It seems to have enough room to widen to four lanes with minor improvements that shouldn't have a significant environmental impact. Are businesses complaining about being left behind? Are all the stones I'm looking at just a breakwater and not structural? I'm betting it's because the Causeway is federally maintained. BC is doing the same thing with the Highway 1 Twinning program. MOT is completely glossing over federally maintained roadway located within national parks (which Parks Canada is slowly doing itself). Actually, since 2014, the Canso Causeway has been downloaded to the Nova Scotia government. Wasn't aware of that. Thanks for letting me know. I think NS would take this opportunity to renumber highway exits as well! It's the only province/state where you can see highway exit numbers go up while the kilometer markers goes down! On a province-wide basis, probably. There's the A-540 in Quebec City though. A-540 looks like it's numbered relative to A-40 (or rather, where A-40 was planned to be), so it's similar to many 3dis in the US. I don't see any km posts on it. NS 104 looks fine - are others not? I do find it interesting that Nova Scotia uses sequential numbers though, especially since the freeways aren't complete. Same with Newfoundland. Where does this happen, mind you I haven't been on very many of the 100-series NS roads.....but it does INDEED happen in Newfoundland, more amusing is that I remember when the kilometer markers went up in Newfoundland on the TCH. I used to do the drive yearly for about the last 10 years, too bad I won't be doing it again anytime soon. If you consider the A-540 as an east-west highway, the exit numbers are correct. But it's tagged as a north-south, so you're right! But guess what; the A-740 is also tagged as a north-south, but in this case, the exit numbers are posted accordingly! There's some unclarified mysteries at the MTQ! 1) You're right; there's no km posts on A-540. On A-740 either, BTW. 2) The phenomenon I talk about in NS is especially for NS-101 and NS-103, that have their exit 1 (or should I say their "exit 1 complex" in case of NS-101, having even an exit 1K westbound!) in Greater Halifax Area, at km posts over 300! They probably use sequential numbers because their 100-series highways are almost as old as the oldest Quebec Autoroutes, and they copy-paste the exit numbering system used then all across New England. I remember seeing km posts on A-540, hence my comment about markers not matching the exit numbers. I will take pictures when I have a chance. Just double-checked, there are markers on the A-540 for km 2 and 4. The km 2 markers (both NB and SB) are just north of exit 5, while the km 4 markers are north of exit 3 (the A-40 interchange). And even if exit 5 is less than 2 km from the southern end of A-540, the last exit at the southern end is numbered 10. 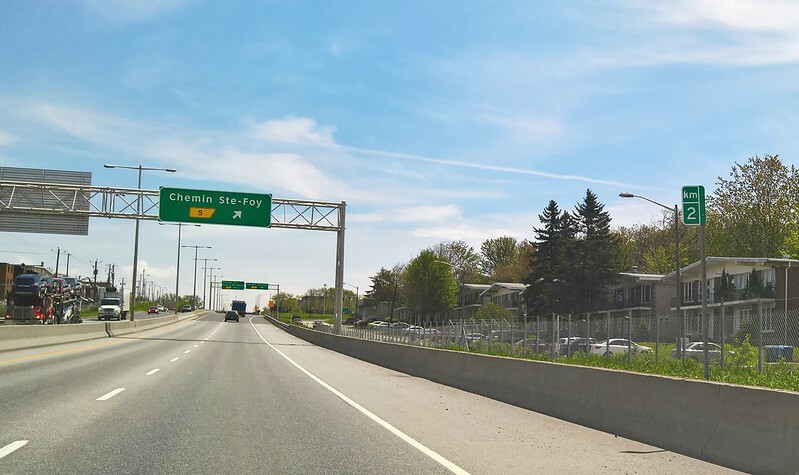 Exits 6, 8, 9 and 10 all exist in that short stretch to A-73 and Pont Pierre-Laporte. Now back to our regular Nova Scotia topic!